edited by Robert E. Alvis and Ryan LaMothe. Pickwick Publications (Eugene, Oregon, 2016). Our Sunday Visitor (Huntington, Indiana, 2016). Over the past 30 years, Tom Walters and his wife, Rita, have conducted numerous significant research studies on the state of catechesis in the United States, and on the men and (mostly) women who are responsible for it in U.S. dioceses and parishes. Walters taught catechesis for many years at St. Meinrad Seminary and School of Theology, where he also served as academic dean on several occasions. Upon his retirement, a “Festschrift,” or collection of writings, has been published in his honor under the title “Prisms of Faith.” Like the work of Walters, this publication provides a serious study on the topics presented. While most books published today on the topic of catechesis provide practical advice for being a better catechist, this small volume addresses the content and practice of catechesis and provides significant insights into the topics addressed. Since the 2006 demise of The Living Light catechetical journal, which had been published by the U.S. Conference of Catholic Bishops, finding substantial articles on catechesis has been difficult, which makes the articles in this collection a welcome gift. Clayton N. Jefford’s article on “Use of Apostolic Fathers in the Catechism of the Catholic Church” examines how the writers of the catechism used the writing of the apostolic fathers (Barnabas, Didache, Clement I, Ignatius, Polycarp, etc.) in creating that text. This helps the reader better understand the catechism through the lens of the fathers, and may change the way we read it. Kimberly F. Baker’s “The Mystery Meaning You” is especially of interest during this Jubilee Year of Mercy. Baker makes clear St. Augustine’s teaching that what sets apart the Christian from the pagan is our willingness to live on the foundational stones of love and mercy for others. As Baker notes, most people are willing to accept that God is loving and merciful of them but balk at the thought that they are to be loving and merciful themselves. This article has the potential to change our approach to catechesis and provides the theological underpinning for Pope Francis’ challenge for ministers to smell like their sheep. Other articles in “Prisms” address such topics as religious education in modern Poland and what the 1983 Code of Canon Law has to say about Christian education. These articles, while well written and informative, will be of limited interest to the general reader. The articles on liturgical catechesis, Catholic identity and adult moral formation, and religious education that promotes Catholic identity will be of particular interest to people engaged in these topics. Each of these articles is well-written and reflects the serious theological reflection given to the topic by the writers. This book is a welcome addition to the field of catechesis and deserves to be given serious consideration by everyone in the church’s educational and formational ministries. 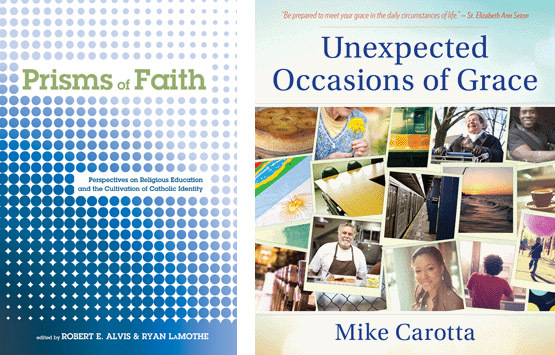 Mike Carotta’s little book “Unexpected Occasions of Grace” is a change of pace from the professional articles found in “Prisms.” Here Carotta shares stories of his encounters with grace-filled people. During his frequent travels to speak at diocesan and national events, Carotta has come in contact with an eclectic group of people with interesting stories to tell. Carotta listens well and is an engaging story-teller. What sets this book apart is his willingness to invite strangers to tell their stories, a vital skill for all catechists, especially as Pope Francis encourages us to encounter God within others. Carotta’s book provides examples of how to do this well. This book will be of interest to all readers.